Since its initial publication in 1994, Morrow's hardcover edition of Jeffrey Gitomer's THE SALES BIBLE has sold over 117,000 copies, and another 100,000 in paperback (published by Wiley).But in the 13 years since then, Gitomer has made himself into a sales powerhouse with huge success around an inventively packaged series of books, with his classic THE LITTLE RED BOOK OF SELLING at its heart.Now at last, Gitomer has taken the title that began it all, and has completely revised it. 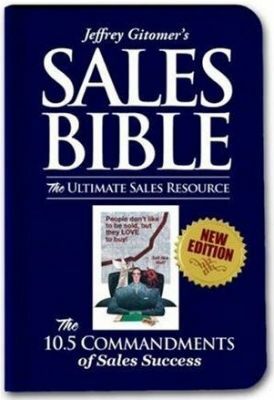 The Sales Bible is totally reworked to fit into his line of bestselling sales titles. It's sure to be THE must-have title for sales professionals worldwide who've already come to know and trust Jeffrey's inventive, irreverent sales wisdom through his "Little [Color] Book of..." series.